Cafe' Coffee Shop, Fast Food Restaurant? Those who have grown in the Philippines will know that one of the favorite past times of the typical Filipino includes snacking and eating all day long. That being said, there is an infinite goldmine to be earned with food businesses, especially snack bar, cafe and restaurants. FaB Caffe’ is a type of a small/medium and inexpensive fast food restaurant which usually serves hot and cold coffee, frappe’ milk tea and snacks and even rice meals. Fab Suffrage Inc. offers the new coffee shop concept with variety of products for franchise nationwide. This concept has promising high profitability of success as it offers a tested quality affordable products where customers can choose from many dishes on a serving line. (pizzas, burgers, fries, frappe, milk tea, nachos, dimsums, siomai, siopao and other meals.) that all ages will surely love. at a low investment of P499,000.00 no hidden charges. 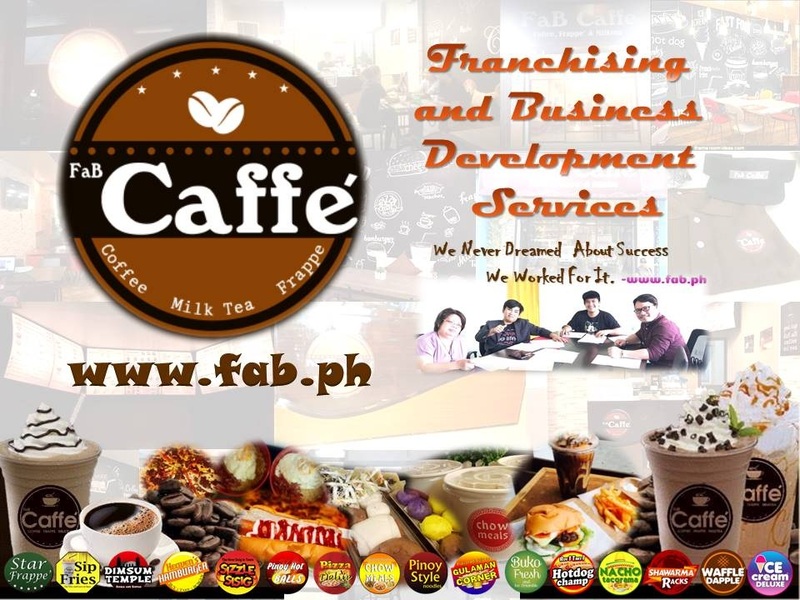 The good thing about Fab Caffe'’ is that we provide lower franchising cost than the others. Not to mention that we are very flexible in terms of product mishmash and the packages the give out. Interested in starting a Fab Caffe Snack Bar and Cafe?